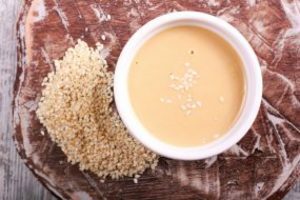 This outbreak appears to be over, but recalled tahini products have a long shelf life and may still be in people’s homes. Consumers are encouraged to visit the FDA website for a full list of recalled products. On November 27, 2018, Achdut Ltd. recalled tahini products sold under several brand names, including Achva, Achdut, Soom, S&F, Pepperwood, and Baron’s with expiration dates of April 7, 2020 to May 21, 2020. The last reported illness began on January 3, 2019. Eight people infected with the outbreak strain of Salmonella were reported from four states: Hawaii, Massachusetts, Michigan, and New York. No hospitalizations or deaths were reported. Do not eat, sell, or serve recalled tahini or products made with recalled tahini, such as hummus, even if unopened. Return it to the store or throw it away. For a full list of recalled tahini products, visit https://www.fda.gov/Safety/Recalls/ucm626750.htm. Contact a healthcare provider if you think you got sick from eating recalled tahini products.